As outgoing Editor for Latin America, I have seen the Global Voices team from Latin America grow tremendously over the past three years. Each of the volunteer authors has dedicated time and energy to serve the mission of Global Voices, and to share their part of the world with a global audience. At any given time, each of the countries that make up the Latin American region has been represented by a talented blogger tasked with the challenge of presenting a wide range of issues in a balanced and fair manner. Now that I am moving on to take the helm at Rising Voices, I am eager to see how the team will take the coverage of such a diverse region to greater heights under the leadership of the new Latin America Editor, Silvia Viñas. Continuing a recent tradition, let's meet some of these amazing people that have been part of the Latin American team (in alphabetical order by first name). Andrea Arzaba [Mexico] – I don't think I've seen a single picture of Andrea in which she was not smiling. Her enthusiasm and friendliness is both sincere and contagious. Recently back in Mexico after spending a semester studying abroad in Spain, Andrea is very active in youth conferences and blogging competitions. She was recently chosen to represent the Think About It organization at the UN Summit to be held in New York City later this month. 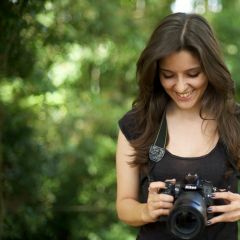 Read her blog One Lucky Life [es] and follow her on Twitter: @andrea_arzaba. Belén Bogado [Paraguay] – Belén is quite the multimedia star in her native country of Paraguay. Not only is she an accomplished print journalist, but she has also hosted her own radio show and television program. In addition, she has brought special recognition to Paraguayan bloggers, including an introduction to the first blogger to write in the Guaraní language, who was featured in a GV post and which caught the eye of the local CNN affiliate. 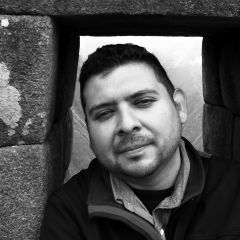 Felipe Cordero [Chile] – Felipe joined Global Voices in 2010, and his participation began shortly after the tragic earthquake struck his country of Chile. He was living in Columbia, Missouri at the time when he volunteered to help with the coverage, as way to draw more attention to the tragedy and reconstruction. His posts helped make the Special Coverage Page of the earthquake timely and diverse. Since graduating from college, Felipe has taken part in many interesting training programs and internships, including one at the Chilean Mission at the United Nations. Read his blog: Política Online [es] and follow him on Twitter: @felipe_cordero. Gabriela García Calderón [Peru] – At the Global Voices Summit in Santiago, Chile, Gabriela received recognition for being the GV member with the most number of translations across all Lingua sites. With more than 2000 translations under her belt, Gabriela wanted to get involved with GV even more. So, she volunteered to become a GV author by focusing on some of the non-political facets of Peruvian society. Read her blog: Seis de Enero [es]. Issa Villarreal [Mexico] – To say that Issa is interested in the urban arts scene in her hometown of Monterrey, Mexico, would be an understatement. In her free time, Issa covers local concerts and music festivals [es] on her blog and other publications. In addition, she is a videographer, and one of her most recent works was filmed a local amusement park. Her three-part series exploring graffiti and urban art across Latin American stands among some of her most classic posts. She also covers other topics, including the #internetnecesario campaign, although I was unable to convince her to write a post on the Mexican delicacy of eyeball taco. Read her blog: Perdida en el Súper [es] and follow her on Twitter: @hiperkarma. 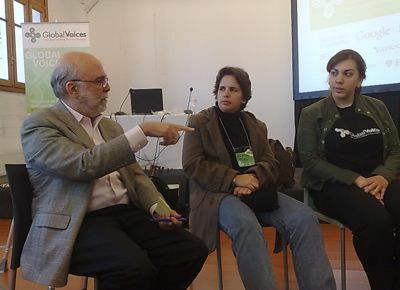 Members of GV Latin America meeting with GV Board Member Rosental Alves at the GV Summit in Santiago. Photo by Juliana Rincón and used under a Attribution 2.0 Generic CC license. Jenny Cascante [Costa Rica] – Jenny is another of our authors that is active in her country in the arts and cultural scene. She has been a part of the super-stylish arts digital magazine De La Bimba [es]. Read her blog: Nube Número Nueve [es] and follow her on Twitter: @nubecina. Jorge Gobbi [Argentina] – Buenos Aires is one of my favorite Latin American cities and most times that I've visited, I've managed to stop by to say hello to Jorge. I don't think I realized how well-known he is in the Argentine blogosphere until he was featured in the La Nación newspaper as one of 5 of the most important bloggers [es] in the country. Probably best known for his travel blogging, he won Best Travel Blog in Spanish awarded by Lonely Planet. Jorge is currently pursuing his doctorate degree in Social Sciences at the University of Buenos Aires. Read his blog: Blog de Viajes [es] and follow him on Twitter: @morrissey. 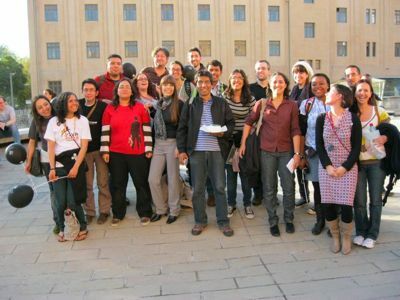 Juan Arellano [Peru] – Ever since Juan has taken on the leadership role for Global Voices in Spanish, the site has thrived. The roster of active translators that he has recruited makes it one of the most diverse and willing teams to bring GV content into the Spanish language. The partnerships and collaborations that he has pursued serves as a model for other Lingua sites. In addition to translating posts, Juan also makes sure that local issues in his native Peru makes it to the pages of Global Voices. Read his blog: Globalizado [es] and follow him on Twitter: @cyberjuan. Juliana Rincón Parra [Colombia] – While I had less interaction with Juliana than before, it was because she was promoted to Global Voices Video Editor. However, she still managed to provide great coverage of important videos from the region, which was whenever she was not knitting or podcasting. Read her blog: Medea Material [es] and follow her on Twitter: @medeamaterial. Julián Ortega [Colombia] – Digital media has become an integral part of Colombian politics over the past several years, and Julián has provided a service for helping GV readers wade through the vast amount of tweets, Facebook groups, and blog posts. He is extremely knowledgeable about the subtle nuances and context of Colombian politics. Julián is also very active in the equinoXio [es] digital magazine. In addition, he holds a special place in his heart for his cats, who can be seen on his Flickr account. Follow him on Twitter: @julianortegam. 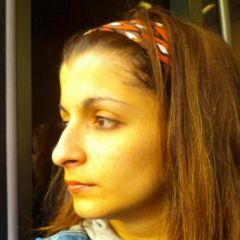 Laura Vidal [Venezuela] – Laura has been personally responsible for making sure that Venezuela is not portrayed as a country that only revolves around polarizing politics. 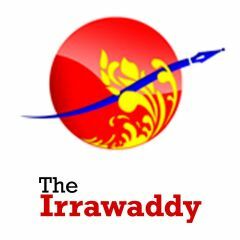 She has made sure GV readers learn about many of the country's talented musicians, writers, artists, and cultural projects. Currently pursuing her Master's degree in Education Sciences at the Université Paris Ouest Nanterre La Défense in Paris, Laura has always offered me a place to crash on her floor during my stops in Paris, and also showcased her culinary skills to me when she made delicious arepas. Read her blog Sacando la Lengua [es] and follow her on Twitter @lenguaraz. Luis Diego Molina and Adriana Vargas [Costa Rica] – I hesitate to not give each of these young authors their own recognition, but they've been working together on the citizen journalism project Habla Costa Rica, where they have reported from the ground during events like the protests at the University of Costa Rica. I've been thoroughly impressed with their willingness to learn and how much dedication they have put into their project. Follow the project on Twitter: @hablacostarica. Lully Posada [Colombia] – Lully is such a strong supporter of citizen media projects around the world, but there is one that has attracted more attention than others. In fact, she has started volunteering with the HiperBarrio project helping out with workshops, but more importantly, providing encouragement and motivation to the new bloggers. 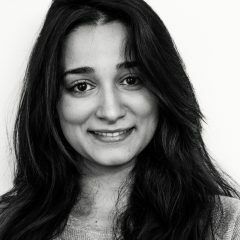 She is also one of the co-founders of the equinoXio digital magazine, and provides interesting interviews. Read her blog: Reflexiones al Desnudo [es] and follow her on Twitter: @lullyp. Milton Ramírez [Ecuador] – Milton or perhaps I should write Dr. Ramírez, has been one of the most prolific GV authors from the region over the past several years. Milton holds a doctorate in Education and is extremely interested in examining the relationship between education and technology. He is also a champion for local technology projects and events in his native Ecuador, including extensive coverage of BarCamps and other digital campaigns. His love for his home region of Loja has placed the city on my must-visits someday. Read his blog: Education and Tech and follow him on Twitter: @tonnet. Rocío Díaz [Dominican Republic] – Rocío is our first author from the island of the Dominican Republic. She took great care in presenting a wide range of issues from the colorful characters of Carnival to the national sport of baseball, as well as the DR's response to the earthquake in neighboring Haiti. She started blogging as part of a national movement for community action, which helps draw attention to problems, as well as solutions in the island's municipalities. Read her blog: Monaco [es]. This is only a partial list, as there are many more authors who have recently joined or who have been recently inactive, but have been an integral part of making the Latin America region as strong as it has become. These authors include: Claudio Ruíz [Chile], Clotilde Castillo [Panama], Nike Jung [Chile], Muna Annahas [Paraguay], Roy Rojas [Costa Rica], Celeste Calvet [Argentina], Aaron Ortiz [Honduras], Leonidas Mejia [Honduras], Mario Durán [Bolivia], Carlos Suasnavas [Ecuador], Mario Blanco [Uruguay], Tim Muth [El Salvador], Rodrigo Peñalba [Nicaragua], Melissa De León[Panama], Luis Carlos Díaz [Venezuela], Rosario Lizana [Chile], Iria Puyosa [Venezuela], Claudia Cadelo [Cuba], Alvaro Berroteran [Nicaragua], HJ Barraza [Mexico]. As you can see, the Latin America team is very diverse, not only in the part of the world that they cover, but in their own personal interests and background. Congratulations to such an amazing team of volunteers for making the Latin America region so well represented at Global Voices. Eddie, this is a wonderful post. Thank you so much for your encouragement and for everything you’ve done for this wonderful region! Great to find out more about the team! Eddie, amazing post, Latin American rocks !!! ¡VIVA LATIOAMÉRICA! ¡VIVA GV! Y … ¡VIVA EDDIE!!!!!! Te queremos mucho <3 ¡GRACIAS! All the best on the new position. I was thrilled with this information. A very interesting, but even more, let me surprise you have knowledge of all. A warm Hug to you and all! !